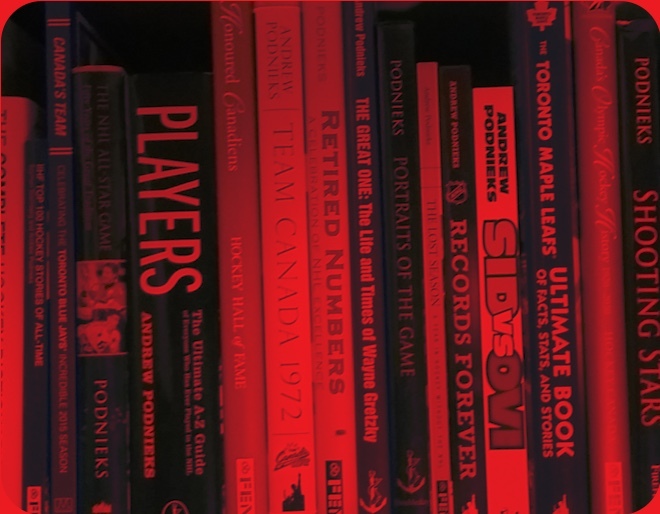 Andrew Podnieks starting working on his first book, Return to Glory: The Leafs From Imlach to Fletcher, on Tuesday, September 6, 1994. It was published by Jack David’s ECW Press in September 1995. Andrew quickly established a relationship with the Hockey Hall of Fame that produced several successful coffee-table books based on the Hall’s unparalleled photo archives. Andrew’s first foray into the world of international hockey came in 2002 when the IIHF hired him to write for its website at the Salt Lake City Olympics. This started what has been a profound relationship that continues to this day. Andrew has been to every Olympics since 2002 and every World Championship in that time as well (excepting 2014 in Belarus). Other events covered include many World Junior Championships, World Women’s Championships, and World Women’s Under 18 events. In 2005, Andrew proposed to the IIHF a media guide for its flagship event, the World Championship. This proved so successful that he created one for every top event, and finally, in 2011, he combined these into one massive tome called simply the IIHF Guide & Record Book, more than 600 pages of history and statistical information of unmatched scope and detail. He has updated and published this annually ever since. Work in international hockey expanded to include relationships with the IOC, Hockey Canada, and USA Hockey, and since 2012 Andrew has been a member of the IIHF’s Hall of Fame Selection Committee. Without a doubt, though, his time with the IIHF reached its zenith in 2014-15 when he was asked to re-write the Rule Book for international hockey. He re-organized the structure entirely, re-worded every rule, and introduced new and simpler language, creating a revitalized document which has been translated into 26 languages and used by all 74 member nations. This process continued for the next Olympic cycle, 2018-22, when he edited a new version incorporating rule changes. Indeed, Andrew created the Late Hit rule, an important step in making the game safer. Andrew also worked for four years with Canada’s Sports Hall of Fame as it sought to re-establish a stronghold in the sports psyche of the nation. He re-designed its entire website (the creative aspects, not the IT work!) and conducted filmed interviews with dozens of its Honoured Members. As well, he successfully nominated several inductees during that time. Starting in 2012, Andrew has become as much a publisher as writer, producing books for exclusive distribution for Indigo in Canada. This relationship has seen more than 30 titles come to fruition as of 2018.